Over the years of working on countless compressed air audits and energy efficiency projects, I’ve noticed an unfortunate trend—companies just can’t seem to fully realize the energy savings in their system. They may go long, catch an extraordinary Hail Mary, run it down the field shaking off inefficiencies along the way, but ultimately, when it comes time to bring it into the end zone, they fail to break the plane. To be fair, it’s not an all-out fumble, but it’s not the stuff of legends either. Here’s one of those stories. An industrial glass manufacturer was running two compressors Monday through Friday to supply their processes. 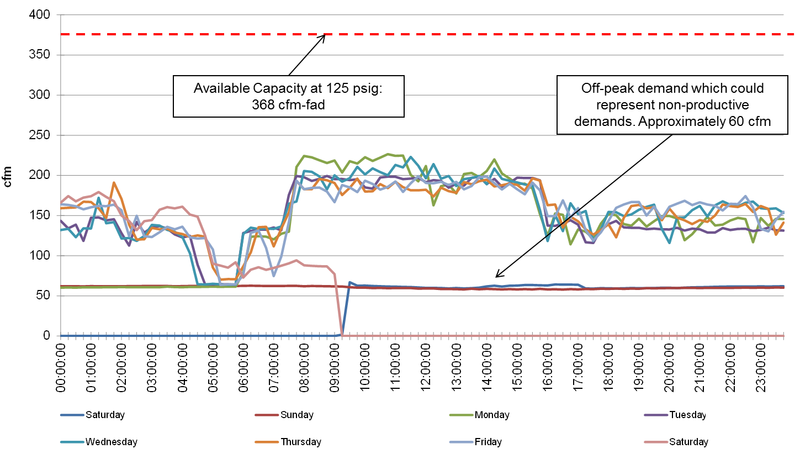 A compressed air audit revealed that the peak flow (excluding startup) was 230 cfm while the available capacity was 368 cfm. While its good practice to have a buffer (an extra 15-20% of the compressed air demand), this system was grossly oversized (60%). Such oversizing can lead to higher energy and maintenance costs. Additionally, the compressors were feeding approximately 60 cfm in leaks—26% of the plant’s overall compressed air demand was simply being wasted—this was found during the weekend portion of the audit. The specific power of their system was quite high: 31.77 kW/100 cfm and they were spending $26,250 in annual energy costs. Annual savings of $16,980? And the fans went wild! Well, not quite. Don’t get me wrong, this 65% reduction is huge—but it could have been even more. Had they called in the special teams and also fixed their leaks—that 60 cfm of wasted compressed air—they would have saved an extra $4,800 a year, bringing the annual energy costs all the way down to $4,470. That’s right, a whopping 83% reduction in annual energy costs. Now that’s something for the record books. So when you’re working on a compressed air optimization project, don’t forget to fix the leaks. Installing new equipment and optimizing plant operations as shown here might be worth a touchdown, but taking the time to fix the leaks is like getting the two-point conversion afterwards and collecting an onside kick to boot.